Review date: 26 September 2000. There's a growing hot-rod scene among PC enthusiasts. And, like the bigger and smellier kind of hot rod, hot PCs can be tricked up both for go and for show. Most of the people painting flames down the side of their computer (oh, you may laugh, but it's been done) might not be taking the idea particularly seriously, but that doesn't mean there's not a market out there for things to dress up and/or light up a PC. What you're looking at is the pcMods model 101b neon light, computers for the decorating of, ten inch, three watt, blue in colour, one. You can also get red and purple lights, and there's a longer 15 inch version, too. Now, this isn't an especially revolutionary product, technically speaking. 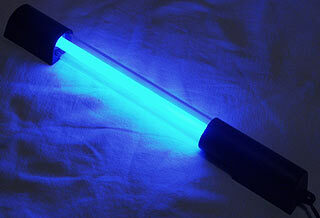 It's just a small neon tube with a power supply that runs from 12 volts. Its original purpose was, presumably, to illuminate amplifiers or speakers or what have you in one of those cars whose owners believe that just sounding like a disco is nothing if your vehicle doesn't look like a disco as well. 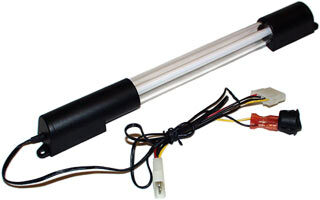 The fluorescent tube and its power supply are encapsulated for safety in a clear plastic sleeve with black moulded end caps. PcMods have simply added a passthrough connector you can plug into your PC's power supply, and a switch. But then, pcMods aren't asking for a ton of money for their kit, either; it's $US29.99. Since the Australian dollar is currently working on achieving parity with the Albanian Lek, one of these things will cost an Aussie buyer something like $AU80, landed. The idea is that you mount the light somewhere handy inside your PC, drill a hole in a panel to fit the switch, and also hack a big hole in one of your case's sides and install a window, so the world can see the spookily lit expensive bits inside your Tiny God. The light kit also comes with one (1) large metal washer, which is only useful if you've also got pcMods' case window kit, which they didn't deign to send me. The window kit gives you a clear acrylic window with curved edges, and edging material to let you mount it in a case-side that's been appropriately chopped. Case-chopping implements not included. If I put a window in the side of a case, I think an axe and some chicken wire may be involved. But it's possible to illustrate the principle by simply leaving the side of the case off. So I did. I tried the pcMods kit out in my extra-spiffy Lian Li PC-60 aluminium case (reviewed here). I'm not about to desecrate this groovy case with a switch hole for the sake of the review, so I gave that a miss. It wouldn't have been hard to install it, though. The switch has spade lug connectors, so you can disconnect its wires when you're mounting it in a case. There's a sticky-label template included to help you drill the hole properly. If you don't feel an urge to use the switch, of course, then you needn't drill a hole for it - you can just turn it on and leave it inside the case for a permanently lit PC, or even remove it completely and splice the wires together. There's some double-sided tape included for mounting the tube, and there are screw lugs on either end of the light too. Smaller cases stuffed to the gills with equipment don't give you many mounting location options, but if you don't have a great big card in the last motherboard slot, you should be able to fit the tube in at the bottom of pretty much any tower form factor case. Sticking the tube in place is easy, and the pass-through power connector means you don't need a spare power plug. 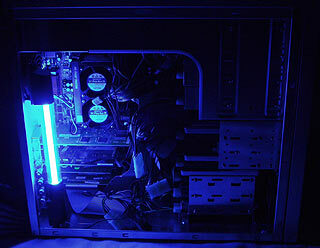 A three watt neon like this is roughly equal to a 15 watt incandescent globe, so this little tube actually lights up the inside of the PC quite brightly. Lights are rated according to the power they consume, not the amount of light they emit. An ordinary hundred watt light bulb draws a hundred watts of power, but it only emits about ten watts of that power as visible light. Most of the rest is lost as heat. Neons waste a lot less of their input power as heat, which is particularly good news for PC hot-rodders who would really rather not add much more heat to the inside of their case. With the side off the case, an impressive amount of light gets out of the computer. You can easily read a book by it at a distance of a couple of feet. The light also gets out through every crack in the case. It lets you really nail that subtle "Powered By Something That Crashed At Roswell" look. 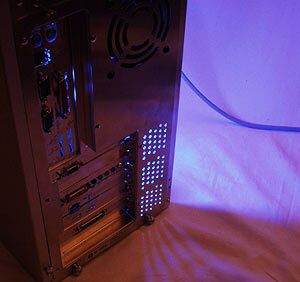 The back of most cases has more holes than the front, and thus glows more impressively. If you feel like running odd things from your PC power supply, you've got quite a lot of options. There are, for instance, lots of electric car-decoration products that can be used on PCs, too. Anything that can run from a car's 12 volts can run from a PC's 12 volts as well, as long as it doesn't draw too much current for the PC power supply to handle. For that reason, 2000 watt subwoofer amplifiers aren't going to run from a PC power supply. Fortunately. 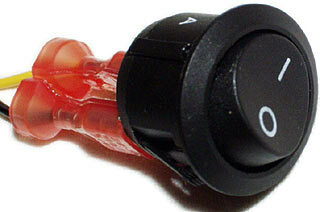 And you're probably not going to be able to manage pin-spot driving lights, either. What a shame. But lower current lighting gizmoes - no problem! I had a bit of a look around. What did I have that ran from 12 volts and looked interesting? The globe's power supply runs from 12 volts. Actually, it rather wants to run from a bit more than 12 volts, but you get a decent display from only 12. At 12V, the globe's peak current draw is about 1.2 amps. That's well within the reach of a PC power supply, provided it's not in a really stacked system. Even cheapo 235 watt ATX power supplies are good for eight amps or so on the 12 volt rail. 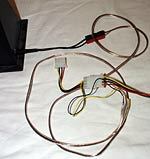 ...and in short order had a four pin Molex passthrough plug adaptor for the plasma globe's DC lead. 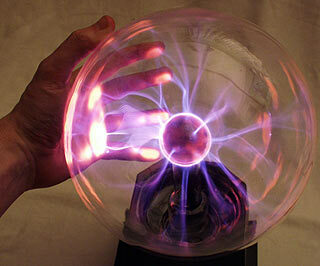 Since a plasma globe is, essentially, just a little Tesla coil power supply hooked up to an electrode in the middle of a mostly-evacuated glass bulb, it's got a substantial electric field around it. My dinky globe is perfectly capable of dimly lighting any fluorescent tube you wave near it, and the heftier ones made by Tesla hobbyists can actually present a significant electrocution risk. 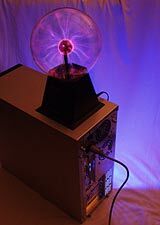 The electric field's not likely to cause anything in your PC to misbehave if the globe's kept a reasonable distance from anything not shielded by a nice earthed case. But given that the field's well into the kilovolt range (with minuscule current capacity) several inches from the globe, I wouldn't be surprised if fooling around with one near static-sensitive components, of which there are many in modern PCs, could destroy them. I think we can take it as read that this is not a product for everyone. But if you're looking for a way to make your custom computing rig distinctly different, this most certainly is it. But $AU80 or so's a bit steep. For US buyers, this thing's a decent deal. For Australians, particularly with the current exchange rate (it's all an evil plot, probably involving the Rothschilds and the Masons, to give American tourists a cheap Australian Olympic holiday, dontcha know), it's not as attractive. Australian buyers not averse to a little wiring work would, I think, do well to check out a place like Jaycar Electronics, which now has a small selection of 12 volt neon gear. For PC prettification purposes, their ST-3130 and ST-3134 dual 12 inch neons, in red and blue respectively, look favourite. They only cost $AU59.95. Jaycar also have got larger colour changing tubes and ropelights and twinkly lights and, God help us all, disco balls as well. If you're afraid of wiring, though, the pcMods kit is not ridiculously expensive, and is about as easy to install as such a thing can get. If you like this sort of thing, then this is indubitably the sort of thing you will like.